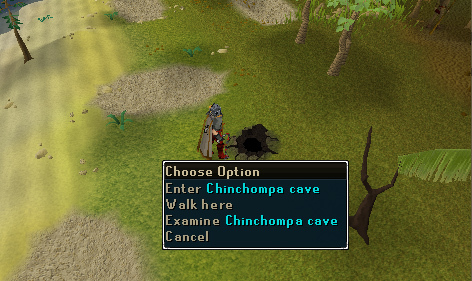 Big Chinchompa is a Distraction and Diversion for the Hunter skill. Released on 28 August 2012, it involves following the instructions of one Nyiriki Tapio, a gnome whos seeks to send the Plutonial Chinchompa to sleep by feeding it Soporith Moths. In return, you'll get Hunter experience and temporary access to private hunting grounds afterwards. Nyriki Tapio is a gnome who's good at hunting. According to his wife Mieliki however, he's not as good as he thinks he is. It will come as no surprise then that he's turned to you for help. Nyriki is trying to find ingredients for his wife's alchemical interests however, things aren't going so well for him. Gather the moths to put a rather obese looking Plutonial chinchompa to sleep so that Nyriki can finish his work and gather the chinchompa's chemicals for Mieliki. Note: There are no requirements to play, but a higher Hunter level gives you more experience and greater rewards. 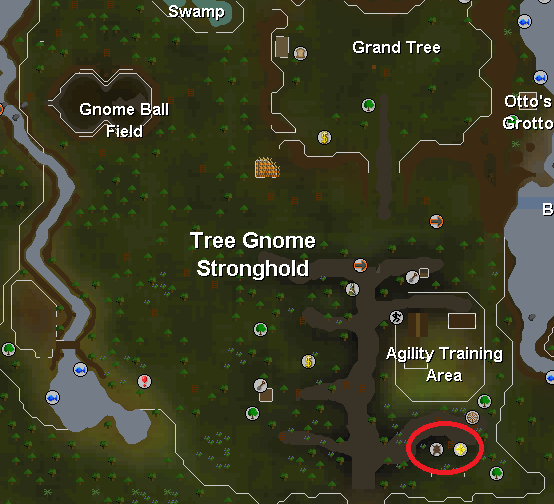 Speak to Nyriki the Gnome, located at different Hunter locations around RuneScape. 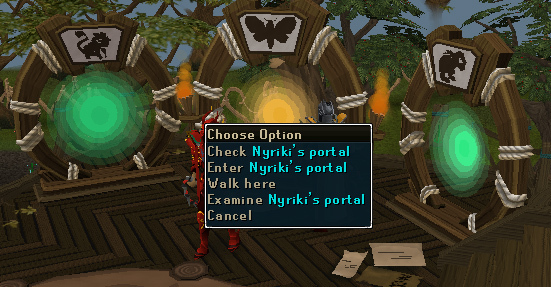 The current time in RuneScape is 11:20 AM and the portal to reach Nyiriki has not spawned yet. It will respawn in approximately 40 minutes. Nyiriki spawns every hour at various different Hunter locations. When he appears, the ground will shake several times and you will find him standing next to a hole in the ground. The easiest way to find out when and where he will appear is to go to his house in the Tree Gnome Stronghold, where his wife, Mieliki, runs his shop and experiments with alchemy. She can be contacted with the NPC Contact spell from the Lunar Spellbook which requires 1 Astral, 1 Cosmic, and 2 Air runes, or alternatively you can go there yourself and right-click "check" on the large yellow portal. This will give you the number of minutes before Nyiriki appears and will offer a teleport to the location where he will be at that point. You can only teleport with this three times a day (this resets at 1 A.M. GMT), although you can check as many times as you want. 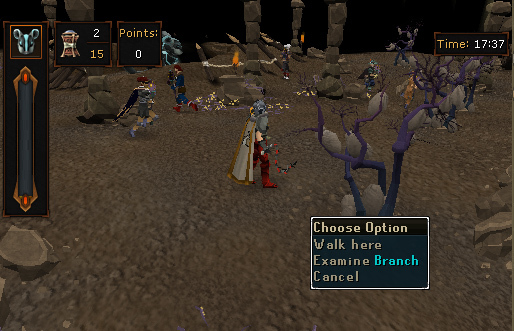 You can get there by using the Spirit Tree network, Gnome Gliders, or by teleporting to Ardougne and walking northwest out of the city. When Nyriki appears, talk to him and he will give you a short introduction. A hole will open up and you'll start the game when you climb in. There may be some waiting time, as you'll actually be switching to an instanced world at this point. If you get a 'connection failed' message, keep trying as this is likely to only be a temporary problem. The object of the game is simple: to send the Plutonial Chinchompa to sleep by throwing soporith moths into its nest. You have 20 minutes to do this. Soporith moths are collected in the moth jar that you are given upon entering the game. Should you somehow lose your moth jar, you can get another one from the sack next to the exit. There are three ways to catch moths. Firstly, if you collect and wield a Protea flower, found at the corners of the cave, moths will sometimes fly onto it and you collect them automatically. Second, if you see a tree that is shaking, click on it! Assuming you have the required level, you will catch whatever moth is on the tree and add it to your jar. Finally, just click on moths that are flying around the cave. This will be your main way of getting moths, and it's highly effective. Any moth that you can see has no competition, as other players will see different moths that will be invisible to you. You can track how many moths are in your jar through the overlay, seen at the top-left of the above screenshot. This also shows you how sleepy the chinchompa is. Once the bar is entirely yellow, it will fall asleep. Finally, you can see how many points you've got. This goes up every time you empty your jar into the nest. 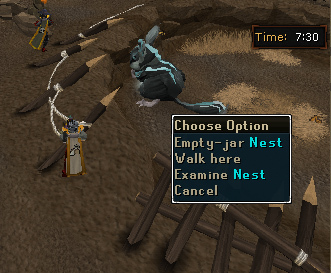 At any time you wish to exchange your moths for points and experience, click on the chinchompa (Empty-jar Nest) to empty your jar into the nest. Your jar can hold a maximum of 15 moths, though there's no benefit to releasing them all at once other than convenience. Particularly towards the end of the game, releasing your moths more frequently may be beneficial, as you don't get points for keeping them in your jar and not throwing them into the nest! Here is a table of the different types of moths, their required hunting level, and experience/points gained. The points you receive are called Competence Points. You may use them to purchase a variety of rewards. To claim them, go to Mieliki's shop in the Gnome Stronghold, right click on Mieliki and select "Rewards". Only the quota tickets require levels in the Hunter skill to purchase, and these are by far the most useful rewards to purchase. Hunter Experience 1 You are rewarded an extremely small amount of Hunter experience. 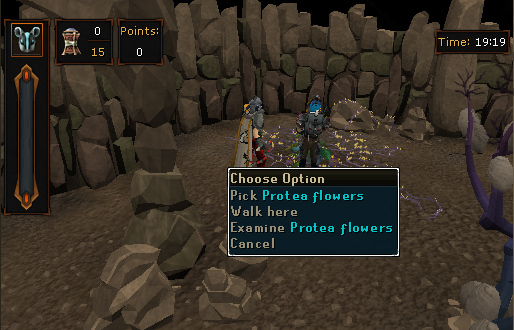 Protea Flower 1 When not in the Big Chinchompa game, the Protea Flower is used as a "fun" weapon; it has no stats. Quota tickets are a reward that help you use Nyriki's private Hunting area. They award you the opportunity to catch one Hunter creature specified by the type of ticket. Competence points can be used to access Nyriki's private hunting area. You may notice that in Mieliki's house there are five green portals near the orange portal. Enter the portal that corresponds to whatever quota ticket you have, and you will be teleported to that creature's field. One ticket entitles you to catch one creature. A ticket is used up every time you catch a creature. The areas are private in the sense of being privately owned by the gnomes. While other players can enter them, they are large enough that this is not a problem: once more than three players enter a single version of Nyiriki's grounds, another instance of them is created for extra players. In this way, there is always room to hunt without competition. You can also invite friends into your own hunting grounds with the communication device by the portal.